"Our next fundraising event will be an evening with local authors Mike (writing as Alex) and Helen Walters. 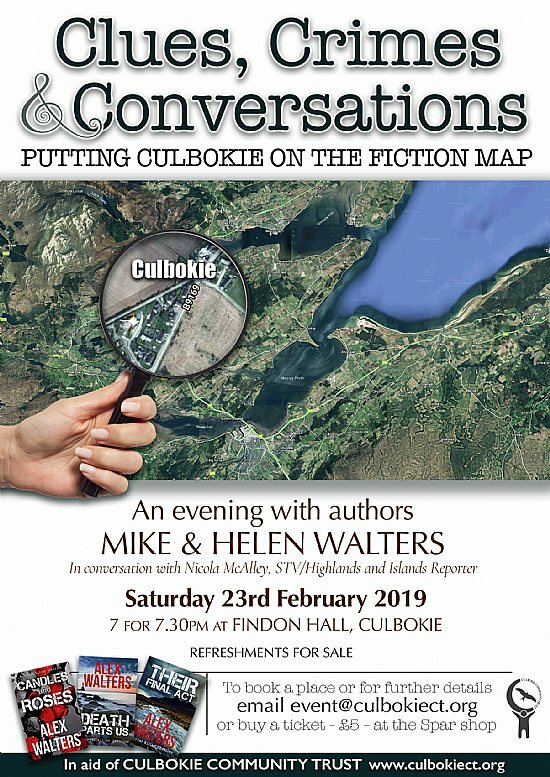 Titled ‘Clues, Crimes and Conversations: putting Culbokie on the fiction map’, it will be held on Saturday February 23rd, 7 for 7.30 at Findon Hall. In advance I’ve just been reading the three books by Mike in the DI Alec McKay series set on the Black Isle – and now I am completely spooked! Several locations have now assumed new identities and my imagination is in overdrive! Come and hear more – tickets (£5) are available from the Spar shop or can be reserved at event@culbokiect.org. Wine and beer will be available for purchase."